Tomorrow at 1:30 pm GMT Uncle Sam will print its consumer price increases for the month of March. What are traders expecting from the event and how might the dollar react? Consumer prices had risen by 0.2% in February, which was better than the 0.0% reading in January and the 0.1% dip back in December. The core figure, which excludes volatile items such as food and energy, clocked in a 0.1% growth when analysts saw it at 0.2%. The annualized figures didn’t look much better. Heck, both headline AND core CPIs missed expectations! At the time, the weak consumer price release made dollar bulls edgy because there were already whispers that the Fed would dial down its tightening schedule (they did) in the members’ meeting the following week. The weak CPI release, combined with a disappointing PPI report the next day, helped drag the dollar lower for most of the week. What are traders expecting this time? Market geeks are a little more optimistic for March, projecting a 0.2% monthly increase in core consumer prices and a 1.8% jump in the headline annualized CPI. 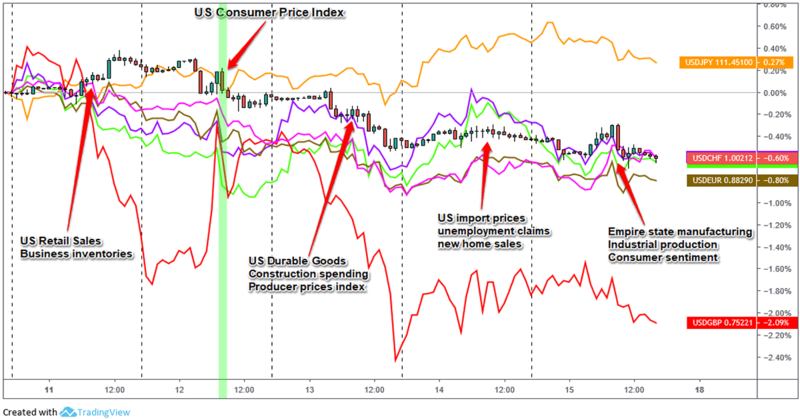 Leading indicators are showing a mixed picture, however. The price index of Markit’s manufacturing PMI reflected the slowest rise in factory gate prices since December 2017, with input prices mostly being lifted by higher tariffs and raw material prices. Markit’s services PMI noted that “inflationary pressures eased further in March” as input prices dipped to a two-year low and output prices rose at a softer pace. Meanwhile, prices in ISM’s manufacturing PMI reversed two months of contraction by returning to an expansionary 54.3 (+4.9%) reading. ISM’s services PMI echoed the optimism with its price index rising for a 22nd consecutive month (+4.3%) in March. Historicals aren’t much help either. As you can see below, analysts have a slight tendency to overestimate March’s price increases. This “only” happened for both headline and core CPIs five out of the last ten years, though, so don’t read much into it. How might the dollar react? Traders will be looking at U.S. inflation numbers because it’s the main reason why Trump thinks the Fed should cut its rates. If this week’s numbers surprise to the downside as the historicals and mixed leading indicators suggest, then we might see the odds of the Fed cutting its rates as early as this year could go higher. But remember that the dollar is still relatively more attractive compared to its major counterparts these days. Thanks to Brexit headlines and even more dovish central banks like the ECB, BOJ, and the RBNZ, tons of traders would still rather hold Greenbacks. So unless we see a dramatic drop in consumer price prospects, the dollar will likely see limited downside action. And then there are the catalysts around the CPI release. If you’ve looked at your forex calendars, then you’ll know that the ECB is publishing its monetary policy decision during the London session while the FOMC will release its latest meeting minutes hours after the U.S. CPI report. Unless these events turn out to be duds, traders will likely wait for the dust to settle, or the PPI report scheduled the next day to be released before they fully price in tomorrow’s data. That’s it for me today! Who here is planning on trading the event? Got any trading plans or biases you’d like to share?